We are not currently accepting applications for the 2019 PLP. The deadline to submit an application for the 2019 PLP was midnight on Tuesday, Nov. 13. 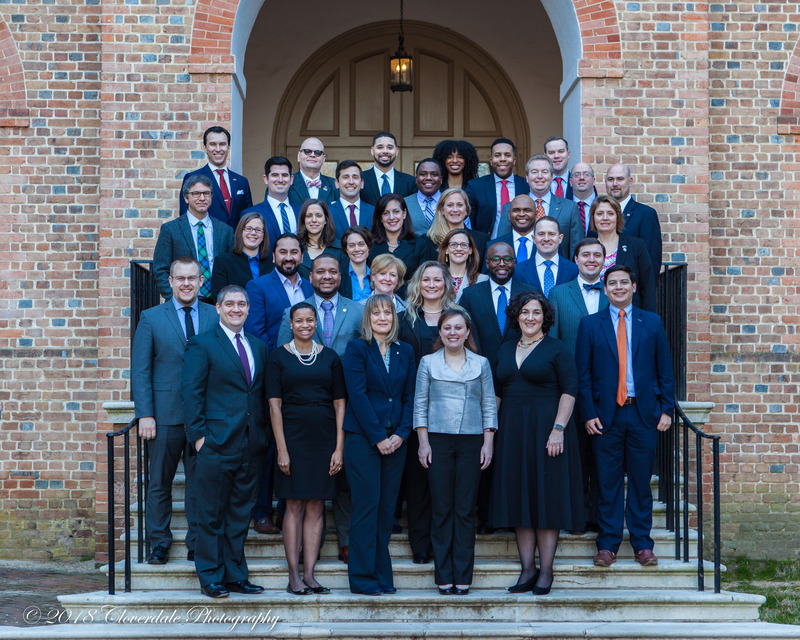 The Sorensen Institute's flagship Political Leaders Program (PLP) is a leadership development program for residents of Virginia interested in becoming more active in public service, whether as community leaders or as elected officials. Participation in this program has become a traditional "first step" for future political leaders in the Commonwealth. The class meets in various locations across Virginia, once a month from March through December except for the month of July. Ethics in Public Service - The program will include a study of general ethical principles as they relate to public service. The practical application of bipartisan cooperation in politics, including the use of mediation techniques, is also a central theme throughout the program. Public Policy - Participants will experience presentations and discussions regarding a variety of public policy issues facing state and local governments including but not limited to the state budget, transportation, education, healthcare, workforce and economic development, crime and public safety, and the environment. Influencers in the Political Process - Elected officials are not the only ones who impact the workings of government in Virginia. The class may learn about the changing nature of Virginia’s electorate, nonpartisan redistricting, campaign finance reporting, conflict of interest laws, efforts to protect civil liberties in the Commonwealth, the Freedom of Information Act, Law Enforcement and Criminal Justice, and much more. (For those interested in an intensive, "ready-to-run" campaign education, see our Candidate Training Program). The Sorensen Institute seeks men and women of all ages from across Virginia who are actively involved in their communities and who desire to participate in the political process. Approximately 35 participants are selected each year in a highly competitive selection process that includes a detailed essay-based application and in-person interviews by staff members, regional board members, and alumni. The Sorensen Institute typically receives more than three times as many applications for the Political Leaders Program each year as there are available spaces in the class. The application process is open to Virginia residents who are eligible to run for political office. A commitment to fully participate in the program is required. We ask that you confirm in advance your availability for the session weekends below before you apply to the program. After we review your application you will be contacted to schedule an in-person interview. Tuition for the PLP Class of 2019 is $3,250. Acceptance to any Sorensen Institute program is need-blind. Requests for financial aid or scholarships will be dealt with on a case-by-case basis once the selection process is completed. In 2018 we met 100% of demonstrated financial need through a combination of grants, scholarships and financial aid. No individual is ever denied participation in a Sorensen program because of inability to pay the tuition cost. Participants are responsible for their own travel expenses, but food and lodging costs are covered by the tuition. More information about how to apply for financial aid is available on our Financial Aid page. Financial aid applications must be submitted by Saturday, December 1st to be considered. According to IRS guidance, the Lifetime Learning tax credit applies to students who are enrolled in one or more courses at an eligible educational institution. The course or courses must be either part of a postsecondary degree program or taken by the student to acquire or improve job skills. There are many other details surrounding the Hope and Lifetime Learning Tax Credits. We suggest that you contact your own tax professional to see if you qualify for these credits. Unfortunately, neither the Sorensen Political Institute nor the Weldon Cooper Center for Public Service can provide tax advice. You can also contact the IRS' Office of Public Liaison at 202-622-2970 or view Publication 970 on the IRS website for further information. The Political Leaders Program runs for ten months each year, March through December. Classes meet one weekend a month and are held in different locations across the state. With few exceptions, a typical weekend schedule begins at 12:00pm on Friday and ends by 12:00pm on Saturday. Weekends typically begin with an optional, dutch-treat lunch on Friday, followed by a tour, dinner, and guest speaker. Saturdays usually include debates, speakers, and panels in the morning starting around 8:30am and departing around lunchtime. We ask that you confirm in advance your availability on the weekends below before you apply to the program. *Full attendance on opening weekend in March is mandatory. **For our Southwest weekend, hotel rooms will be offered on the night on Thursday, September 19 due to travel distance. No official sessions will take place on Thursday. If you would like to refer a candidate to our Political Leaders Program, please visit our referrals page. Information provided will only be used to contact potential candidates about applying for our program. If you have any questions or need any assistance submitting your application, please contact Lauren Gilbert.